An estimated 250 activists from around San Diego County gathered in front of the Edward J. Schwartz Courthouse on Monday, March 12th, to protest against Donald Trump’s visit to the city the following day. Organized by Unión del Barrio, a local activist group, the demonstration, named Fuera Donald Trump, is one of a series of events to take place in response to the President’s visit. The event began in a plaza adjacent to the courthouse, where the protesters gathered behind several banners to give speeches in both Spanish and English to the numerous media outlets that were lined up ten feet away from the demonstrators. Groups represented included Unión del Barrio, Indivisible San Diego, and Women’s March San Diego. Among the crowd included several dozen police officers, who maintained the safety of the protesters throughout the event. While the protest remained peaceful, several tentious moments occurred, including several protesters trying to disrupt the flow of traffic outside of the designated march route, and a white truck circling continuously around the route that was affixed with a flag in support of the President. Donald Trump’s visit to San Diego took place on Tuesday, March 3rd. His itinerary included a speech at the Miramar Marine Corps Air Station and a visit to the controversial wall prototypes that have been constructed in Otay Mesa. The protesters took issue with the fact that the wall is being built in the first place, as dissenters argue that the wall is going to end up being a waste of taxpayer money that is symbolic of racist approaches to both foreign policy with Latin America and the treatment of both Mexican Americans and undocumented immigrants in the United States. After this, the President headed to Los Angeles for a fundraiser for the Republican National Committee. 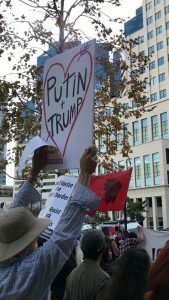 San Diego is no stranger to protests against the President and his ideals. After the success of the first event, the second annual Women’s March took place in downtown San Diego on January 20th, with a sister march occurring on the same day at Palomar County. Protesters here gathered to promote voting in the face of the xenophobia that has increased across the United States since Trump’s inauguration. The morning before the Fuera Donald Trump protest, activists gathered in Chicano Park in Barrio Logan to similarly protest against the President’s visit. Hosted by several organizations, including Alliance San Diego, San Diego Immigrant’s Rights Consortium, and Unión del Barrio, the even offered the press a more in-depth look into the message behind the activism. Several more events are scheduled for the week of Trump’s visit. 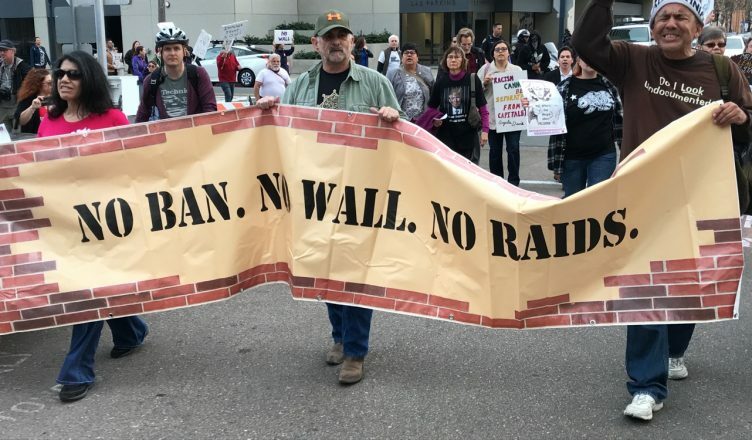 Included are two protests that were held on the day of Trump’s visit; the San Diego Undocuyouth Resist Trump protest, which took place at the County Administration Building, and the Protest Trump’s Visit and Border Wall protest, which was hosted by Women’s March San Diego in San Ysidro.